You may have seen some surprising interpretations of Star Wars, but you've never seen anything like this. In advance of the upcoming release of Star Wars: The Last Jedi in December a folding screen painted in ink featuring the main characters of the movie was unveiled this week. The screen was painted by 39-year-old Masayuki Kojo and went on display at Byodoin, a Buddhist temple on UNESCO’s World Heritage list in Kyoto Prefecture. A traditional Japanese Kyogen (comedy play) inspired by the movie was also performed at the event. It starred Master Kisyu Shigeyama Chisaburo, Shigeyama Shoji, Suzuki Minoru playing R2-D2, C-3PO and Kylo Ren respectively wearing traditional clothes and masks. Kyōgen (狂言) also known as "mad words" or "wild speech", is a form of traditional Japanese comic theater. Lines are delivered loudly in a rhythmic, sing-song voice. The pace, pitch, and volume are all varied for emphasis and effect and that explains the voices which sound like a record played backward. Rian Johnson, who's directed The Last Jedi attended the event and noted the historical Japanese roots to the original film. "It was a wonderful Kyogen!" 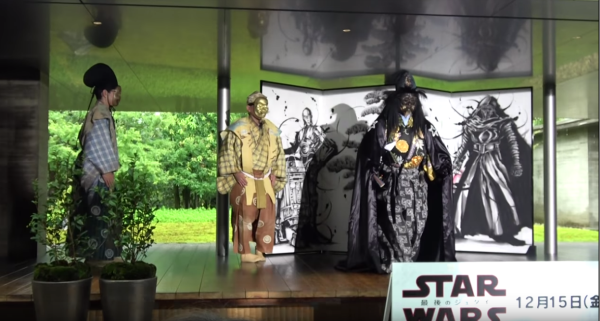 he said, "I felt deeply the connection between Japanese culture and 'Star Wars'." At first, it's jarring, but when you get used to the style it's very impressive. Vader's voice is really wild in Japanese. When I was a kid, I would've known what they were saying.